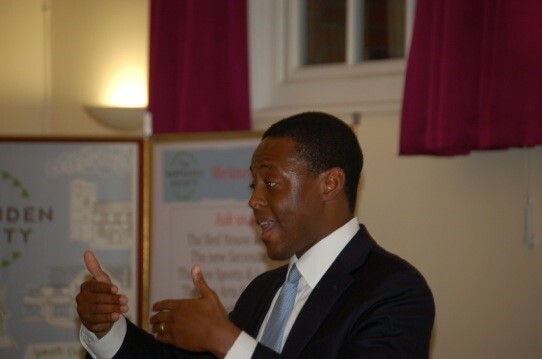 Addressing an audience of over 100 of his constituents at a packed September meeting of the Harpenden Society, the town’s new MP Bim Afolami called for a more strategic approach to planning challenges, rather than the ad hoc process which often resulted from local authority differences. He cited the failure of St Albans District Council (SADC) to consult with neighbouring authority Dacorum in formulating its Strategic Local Plan, suggesting that in shaping the future of Harpenden there should be more ‘inter authority’ collaboration, especially between Hertfordshire County Council, SADC and the Town Council.That was needed most crucially, he said, if supporting infrastructure - roads, schools (HCC responsibilities) and even medical services - was to be given due priority at the same time that developers’ major planning applications for new housing were being ruled upon by SADC. 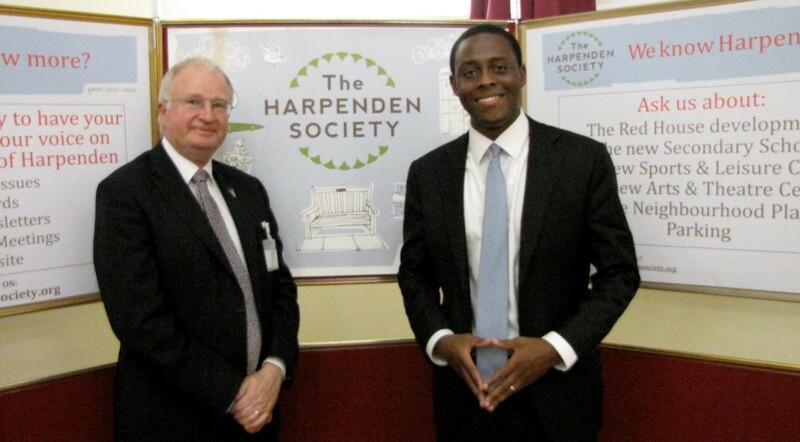 There was no question, said Mr Afolami, that more housing in and around Harpenden was needed. But if there was to be any chance for those young people growing up in the town being able to afford a new home without moving away, the housing mix had to include 2/3-bedroom flats and houses - with supporting infrastucture. If the matter was not confronted then the prospect of a town which was more than just a ‘dormitory’, somewhere where people could work and live, in what felt like a real community, would be in jeopardy. It was a view reinforced by a meeting he had attended at the Building Research Establishment at Garston, reviewing the future of Hertfordshire as a county, where he had been impressed with the proclaimed axiom of ‘let’s keep people local’, including the self-employed. His perception of Harpenden as ‘a small town which feels like a village’ was, he felt sure, shared by its residents and by visitors. And he was keen to ensure it stayed that way. A visit to Hammonds End Farm, escorted by the farmer Stuart Roberts, had given him a feeling of Harpenden’s traditional and attractive rural setting which, he said, needed to be retained. In a lively Q+A session following his introductory remarks, Mr Afolami agreed that a growth in Harpenden’s population (from around 34,000 currently) was inevitable, with a 10% increase possible in the next decade. While such growth might not be unreservedly welcomed, he cautioned that any criticism or protest directed at the planning authorities should be constructive. He said it should be remembered by protesters, for example, that small - typically local -builders were often ‘more sensitive’ to residents’ concerns about environmental issues than larger developers based outside the area. In response to a complaint from David Rankin, chairman of Harpenden Green Belt Association (HGBA), that SADC planners regarded building development in Harpenden as being less important than in St Albans itself, Mr Afolami pledged ‘to stand up for’ his constituency, being ready and willing to debate Harpenden’s particular Green Belt issues with the Secretary of State. That would include, in order to meet St Albans District’s now increased housing target, the possibility of ‘densifying’ development in and around the city centre, by ‘building upwards’. He nevertheless emphasised his good working relationship with St Albans MP Anne Main, where they hoped to engage pro-actively in the preparation of the SADC’s revised Local Plan. On a separate issue, they were collaborating to address the question of noise disturbance from aircraft flying into and out of Luton Airport. He added that he recognised the concern of HGBA and others that the green space between Luton and Harpenden’s northern boundary should not be eroded, with the implications for greatly worsened traffic congestion on the A1081 a vital secondary issue. Mr Afolami’s view was that ‘there should be no coalescence across the Hertfordshire-Bedfordshire border between Harpenden and Luton’, to which end constructive liaison between SADC and Central Bedfordshire DC planners was essential. It was clear that Harpenden’s tough car parking challenges were fully recognised by the town’s new MP, and he pledged support for the idea of double-deck parking at the railway station. Having had meetings with Thameslink, he said ‘it looks doable and I hope it’s not impossible’. There was enough architectural expertise available, said Mr Afolami, to avoid such a two-level car park being as ugly (as described by a questioner) as the station footbridge erected a few years ago. More immediate good news for commuters, which had emerged from his meetings with Thameslink, was that new trains, many with twelve instead of eight carriages, would bring a 20% increase in capacity over the next 18 months. Without being drawn too specifically on his Brexit views, Mr Afolami said that, at a local level, he would press for Rothamsted Research to have continuing access to the single European market, and for the numerous non-British EU citizens working at Rothamsted to retain their jobs there.